Nearly a year ago, the EADS E-Fan electric airplane was shown as a concept at the Paris Air Show, but it hadn’t officially taken to the air. 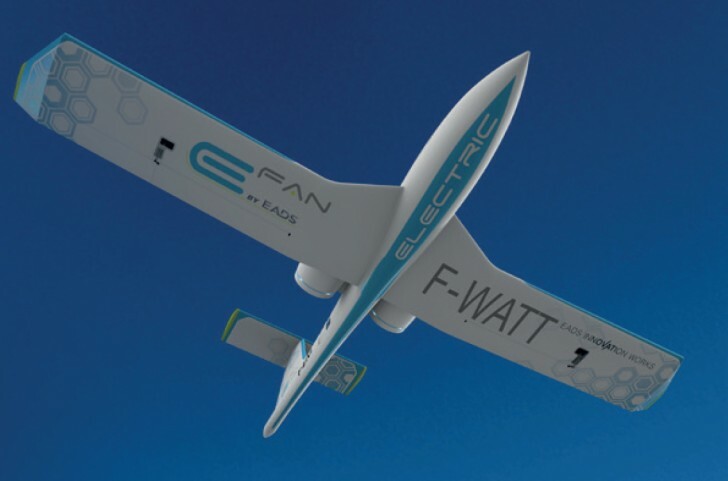 Now, we have seen electric airplanes, such as the SolarImpulse HB-SIA, making pure electric flights, but the EADS E-Fan is something a little different. The HB-SIA uses large propellers connected to electric motors, as well as a huge wingspan for lift and efficiency. These would never work for a compact electric airplane, such as the EADS E-Fan, based on the tiny Cri-Cri airframe. Instead of open propellers, the E-Fan uses electrically-driven ducted fans, which improves fuel economy. In the case of the E-Fan, this helps to reduce the size of the onboard lithium-polymer battery packs to something a bit more manageable, saving weight, money, and increasing range. The EADS E-Fan is expected to be built as a general aviation training craft, but just because it’s an electric airplane doesn’t make it slow. The lightweight composite body and compact size could be significantly overpowered if Airbus installs anything over 30 kW per side, which gives the E-Fan a top speed of 136 mph (220 kmh). The demonstrator was built with off-the-shelf lithium-polymer battery packs, but the production version, which might come as soon as 2016, under Airbus’ VoltAir brand, would be outfitted with custom-built battery packs to improve on range, increasing from about an hour to perhaps an hour and a half. Question: Will Chevy Volt Run Windows?